Choosing a puppy is not something to be done impulsively. A lot of consideration must be given to this choice, do not let your heart rule your head. As newfies become one of the most popular dog breeds, they will be bred more and more by puppy farmers and back yard breeders, trying to make a quick profit with no thought for the puppy's welfare, nor for the sort of home they are going to. All they care about is the money. This is Joshua at about five months old. See how healthy he looks? That is what your puppy should look like so try to remember that when choosing a puppy. Your puppy must have three health certificates: elbow scores for both parents, hip scores for both parents, and heart scans. Elbow scores should be at zero or close to zero, hip scores should be under 25 and fairly even for both hips. The lower the hipscore, the less chance of the dog developing hip dysplasia. Heart scans should provide evidence that there is no sign of subvalvular aortic stenosis in the puppy's history. What is their mother like? Is she a friendly dog? Does she come to say hello, does she seem pleased to show off her puppies? A good breeder will breed for temperament as well as health, so be sure that the mother is an approachable dog. Do not be fooled by being told that she is defensive of her pups - this is rarely the case. If the breeder has young children in the house, watch for signs that the children have been allowed to pull the puppies around at will. This sort of treatment can result in a permanently nervous and sometimes aggressive dog. You also need to see the puppy's pedigree and make sure no interbreeding has been going on. Look carefully at the mother when choosing a puppy and preferably the father as well. 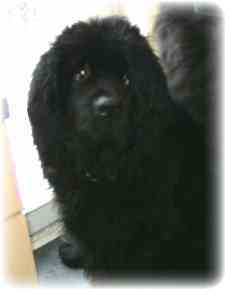 Do they look like a Newfoundland dog is supposed to look like? Or do they look more like you wouldn't really know what breed they are? Try to see the father as well. If he is not available, and you are buying a male puppy, it is advisable to meet a full grown male dog. Newfoundland females are a lot smaller than the males, so be sure you are prepared for that when choosing a puppy. A good breeder will not allow a puppy to leave its litter until it is at least eight weeks old, sometimes ten weeks. This is because a puppy needs to be with his littermates where he will learn bite inhibition and other dog language which you will find it difficult to teach. A responsible breeder will not sell a puppy just before Christmas unless they know you very well or have special references for you. They are always wary of people trying to buy a puppy as a Christmas present for someone who may not be prepared to have a dog, and may not really want one. People seem to think a puppy would be a good present for their little nephew or niece, may have heard someone in the family say that they like newfies. That doesn't mean that they really want one or would know how to care for one. Good breeders are extremely careful about this sort of thing. Christmas puppies also suffer from the time of year, the excitement, the noise. A puppy must be kept quiet for his first few days in his new home and Christmas is not the time to do this. Would you believe that I once read a forum post by a breeder of Red Setters who said that someone had wanted to have one of her puppies, just for over Christmas, because he was red and would look nice in the photographs! This is the sort of mentality breeders have to deal with, so do not be offended if your chosen breeder will not allow any of their puppies to go just before Christmas. A good breeder will also ask you lots of questions. They will want to know if you have experience of dogs, how much experience, what sort of house you have, are you at work all day? Do not be offended by these questions - they are a sign of a caring breeder. They may be reluctant to sell a puppy of this magnitude to a first time dog owner and they may refuse to sell to someone who is at work all day. A good breeder will also tell you that if, for any reason, you cannot keep the dog, they will take him or her back, no matter what age he is. They will want to meet you and have you see the puppies when they are about four weeks old. This is for your benefit as well as theirs, as you can assess the situation and get to know the breeder while they get to know you. It is well worth doing, even if you have to travel a long way to do it. But do not be surprised if there is a waiting list and you have to wait for the next litter. Do not find your puppy in the free ads or on internet sites. Be very suspicious if the puppies are not kept in the house in a proper birthing pen. They should not be outside in a kennel. No good breeder would keep their puppies that way. Never buy a puppy from a pet store, no matter how reputable. They get their stocks from puppy farmers. Be very suspicious if the price is too low. The price of a Newfoundland puppy from a good breeder in the United Kingdom will be in the region of £1200 to £1400. If the price is much lower than that, you need to wonder why. I was once asked for advice by someone whose friend was thinking of buying from an ad she had seen in the free ads internet site. The owners were advertising a litter of Landseer newfoundland puppies for £750 each, which I knew was much too cheap. I emailed them enquiring about the parents' hipscores and heart scans, pretending to be interested. I got no reply, which tells me that no health checks had been carried out. The friend was convinced, however, not by this evidence of a poor litter, but by my telling her that Ferdie is 80kg. The usual exclamation of "I didn't know they got that big" was her reply. It makes one wonder what people think giant breed actually means. You may think you are getting a bargain. You are not. You will end up paying a lot more in vet bills and heartache in the long run. Unfortunately, it is human nature to feel they have got a bargain. I have lost count of the number of people who have told me, very smugly, that they have seen newfie puppies much cheaper than I paid for mine. They seem to think that I will feel that I have been conned, but I know better. And it is just this attitude which keeps the puppy farmers and back yard breeders in business. There is no such thing as a bargain when it comes to buying a puppy and if you are thinking mostly about the price, then perhaps it is not the right time to have a puppy. Of course, some puppy farmers and backyard breeders try to sell their unhealth tested puppies at top pedigree prices, so all things need to be considered. Run away, very fast, if the breeder wants to meet you in a neutral location to hand over a puppy. That is always a sign of a puppy farmer who does not want anyone to see their premises. Try to find out all you can on the phone. Once you have seen these cute little fluffy puppies, it is very often the hardest thing in the world to walk away if things don't feel right. So how do you find a good breeder? Contact the breed club. There are Newfoundland Clubs all over the world who will give you the names of reputable breeders and further advise you on what to look for. Do you need advice about buying a newfoundland puppy?